The management of stormwater to prevent flooding is becoming increasingly important with a growing number of flash floods caused by environmental change and growth in commercial and residential development. Greater areas of impermeable surfaces create surface water runoff, which when not managed can cause damaging and expensive flooding to sewers and populated areas. Sustainable drainage systems (SuDS) control, store and infiltrate surface water, designed to minimize impact on the environment and prevent downstream flooding and deterioration in the quality of river water. Civils and Lintels partners with Polypipe, Aco Technologies and Hydro International to bring you stormwater management products that comply with new, stricter regulations and are both effective and affordable within the scope of the project. Our range of stormwater management products includes soakaways, high capacity pipes and chambers, modular cell systems and flow regulators. Polystorm – The tried and tested Polystorm range for the management of surface water is designed to provide retention, attenuation or infiltration at a variety of depths with a 95% void ratio. Lightweight yet robust, the Polystorm range is ideally suited to deeper applications and can accommodate a wide range of traffic loadings, from pedestrianised areas to large HGV parks. The current range comprises four modular cells and two access options for both horizontal and vertical inspection allowing flexibility of shape, making it ideal for shallow excavation systems, narrow strips or restricted areas. It supports spans from 20 to 80 tonnes per square metre. The system is BBA Approved and is 100% recyclable at the end of its useful life of up to 60 years. Ridgistorm-XL – An innovative large diameter piping system, available in sizes 750-3000mm in diameter with lengths from 1.25m to 12m. 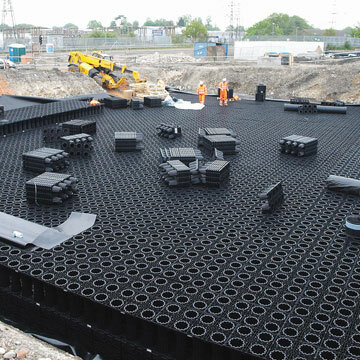 It can be used for a wide range of applications including surface water drainage, foul and combined sewers, large scale flood alleviation schemes and even displacement ventilation and renewable energy. The system is integrally socketed to aid pipe alignment, lighter weight for reduced plant requirements with multiple jointing options include electro-fusion welding, seal jointing & extrusion welding. The pre-fabricated modular system can incorporate flow controllers and treatment devices, manholes and fittings. Ridgistorm is extremely durable, life expectancy of at least 100 years. Being designed for optimum stiffness it has excellent load bearing capability. 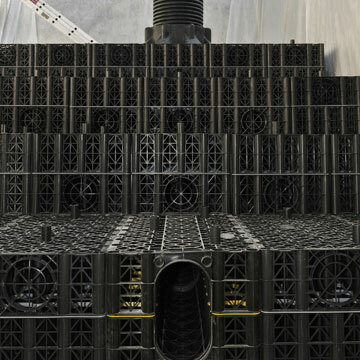 StormBrixx SD – A unique and patented plastic geocellular stormwater management system, designed for surface water infiltration and storage where installation depth and access requirements are of greater importance. The flexible system is enabled by brick-bonding and cross-bonding that optimises stability and allows a multitude of design configurations. With supporting accessories, it can be configured for soakaway/offline and online/adoptable applications. ACO StormBrixx simplifies delivery, site logistics and installation as a result of its stackable ‘nested’ design, which can reduce transport costs by up to 75%. It also supports simple access and maintenance with an open cell structure (97% void space) permitting completely free access for CCTV and jetting equipment. This allows the whole system, including all the extremities, to be inspected and maintained from just a few access points. StormBrixx HD – This system offers increased vertical and lateral strength through more squat ribbed columns, allowing installation under more heavily trafficked areas. With an additional man access unit and a 95% void space, ACO StormBrixx HD supports the more comprehensive maintenance requirements of Local Authorities and water companies. 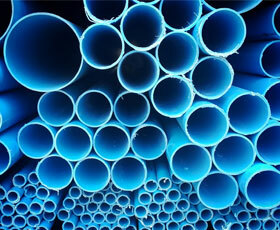 This system is recommended for use in domestic, commercial and industrial SuDS. To talk to us about any Stormwater product or discuss a project, contact your local branch.